If you are sewing the post Edwardian pattern then you need to simply sew a plain seam and stay stitch the allowance in place. Start by placing the two pieces together, face-to-face, and sew a seam 1/2 inch from the edge of the seam allowance. Press the allowance to one side. On the corset used to make the pattern all the seam allowances were pressed toward the center back. Next, the seam allowance is graded to reduce bulk. Trim the seam allowance in half. The side of the allowance that is closer to the exterior of the garment is trimmed in half again. Then sew once more, 1/16 from the seam. If your stay stitch is closer to 1/8 from the seam that's OK too. The finished seam will look like this from the right side. And this from the wrong side. The raw edges will be covered with bone casing so that's all there is to do. Not bad, right? very interesting! your blog is amazing! 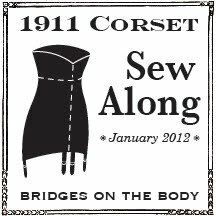 especially for those who will begin studies for making corsets, I must admit I learned a lot here, being an online student. hugs and good luck! Hmm. Is there any reason not to just cut out the Post-Edwardian pattern with a 1/4" seam allowance, and eliminate the first trimming-seam-allowances-in-half step? that would be piece number 2 sewn to the busk seam then! Whoops! It won't happen again! No reason other than handling a half inch seam allowance is easier than handling a quarter inch one. Should we sew the center back facing to the rest of the corset as well? Not yet, we'll do that first thing next week. So does this corset have the bone casings on the inside closer to the body or on the outside? I thought most casings were on the outside and so I would sew the pieces wrong sides together, so the seam allowance was on the outside and then stay stitch it down so the inside was nice and smooth and then the bone casing would be sewn on over the outside. Does that make sense? Am I wrong? Thanks!! This corset has the casings on the inside. If you want to put the casings on the outside that's exactly how you would sew the seams. One thing is confusing, the bottom picture... the red is the stay-stitching, right? I thought the stay-stitching held down the seam allowance, but in the picture it looks like it's on the opposite side? I used red as the top thread and beige in the bobbin. In the bottom picture, which would be the interior of the garment, red is top of the original seam seam, the beige is the underside of the stay stitching. In the picture above that, which would be the exterior of the garment, the red is the stay stitching. Does that help? Sorry for the confusion!